Amongst the various nominations received this year from all over the country, a dedicated social worker from Bengaluru (Karnataka), Shri Gopinath R. has been selected for Prof. Yashwantrao Kelkar Yuva Puraskar 2017. The selection committee of Yuva Puraskar 2017 has selected nomination of Gopinath R. in appreciation of his work for “Child care, protection and development”. 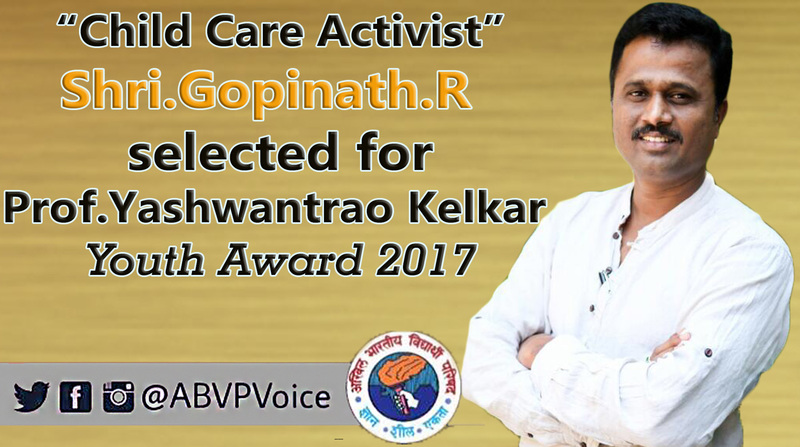 Prof.Yashwantrao Kelkar Yuva Puraskar 2017 will be presented to Shri Gopinath R. on 2nd December 2017 in a special function at the 63rd National Conference of ABVP which will be held at Ranchi (Jharkhand) from 30th November 2017 to 3rd December 2017. This Puraskar comprises of Rs 50,000/- in cash, a certificate and a memento. The primary objective of Prof. Yashwantrao Kelkar Yuva Puraskar is to encourage efforts of young social workers in various fields of public service; acknowledge and respect their good work, bring them into limelight and express gratitude towards them on behalf of the entire youth community. It also aims to motivate students to draw inspiration from the awardees and get inspired to serve the society themselves. Shri Gopinath R, popularly known as Gopi, is a Post Graduate from the Department of Social Work, Bangalore University & hails from a rural back ground. Gopi was also a child laborer and bonded laborer during his childhood. Child hood struggle, unforgettable experiences & the instrumental role played in his life by his step mother were causative factors for Gopi to start Sparsha Trust working for empowerment and holistic development of vulnerable, disadvantaged children who are in a crisis. Through his individual and Sparsha Trust’s efforts about 400 deprived children at 8 of the centers around Bangalore are being taken care of. Till now Sparsha Trust has been able to reach more than 2500 children, who need care, protection and development. To take care of these children about 40 social workers have joined hands with Mr. Gopinath. ABVP National President Prof. Dr. Nagesh Thakur & National General Secretary Shri Vinay Bidre congratulate the recipient of Prof. Yashwantrao Kelkar Youth Award 2017 Shri Gopinath R. and extend their good wishes for all his future endeavours.